We’ve lost a great sensei and one of the world’s greatest Aikido masters. 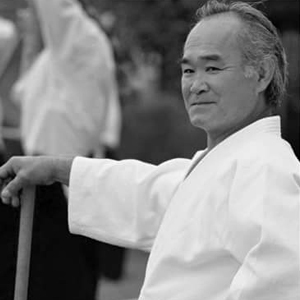 Kazuo Chiba 8th Dan Shihan passed away last month at the age of seventy-five, peacefully and surrounded by his family. Chiba-sensei spent seven years as a live-in student at Aikikai Hombu dojo in Tokyo. He served as special assistant to founder Morehei Ueshiba, O’Sensei, travelling around Japan demonstrating Aikido. Chiba-sensei was then sent to London England where he founded London Aikikai, and to the United States where he founded San Diego Aikikai. You’ll find many eulogies on the internet. I can only add a few memories. The dojo still, Chiba-sensei bowing and striding onto the tatami mat at 6:15 am. Effortless grace, litheness and charisma, the living embodiment of budo. Sensei demonstrating the first technique – utter clarity and precision of movement, overwhelming power. We bow to our partners and practice what he has just demonstrated. Chiba-sensei walking around teaching subtleties. The handful of times he threw me, I felt I’d been pulled into a tornado, even though he was practicing slowly and gently. I can’t say I understood Chiba-sensei – at times he seemed like a man from another century. But I deeply respected and admired him. For me, Chiba-sensei’s greatest lesson was: When you commit to a Way, give yourself entirely, hold nothing back. But a valuable example for those of us who practice the Toyota Way. We pray for your happiness in the next world.